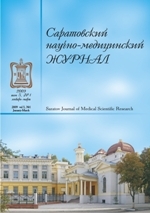 Authors: Kauts О.A., Barabash А.Р., Barabash Ju.A., Grazhdanov К.А., Rusanov A.G., Ivanov D.V. The aim: to study the indices of stress-deforming state of biomechanical system «bone — hybrid anchor» in proximal humerus fractures. Material and Methods. The study of anchorage stiffness in juxta-articular fracture (type 11A3 by AO/ASIF) through applying three load types: axial (200 N), transverse (30 N) and torsional (5 N*m) was conducted followed by CAD modeling in SolidWorks and the analysis of stress-deforming state of the system «bone — anchor». Results. While studying the stability of «bone — anchor» system it was found that a new device for proximal humerus fracture ostheosynthesis under the applied loads do not decompose with maximal translocations of bone fragments and maximums of equivalent stress being present under torsional load and comprise 1.6 mm. and 152 Mpa respectively. Conclusion. The application of hybrid devices for juxta-articular fractures of humerus allows carrying out minimally traumatic anchorage with the following early functionality of the injured segment.